I grew up in the 1940's during the post depression, WWII era. Even with the turmoil our nation was in, my parents always took time to make sure my 3 brothers and I appreciated the 4th of July holiday and what it stood for. There was always a picnic with all the goodies. Mom would pack up a scrumptious lunch with Southern fried chicken, roasting ears of corn to cook on the grill, potato salad, coconut cake (my Dad's favorite), and a huge watermelon. 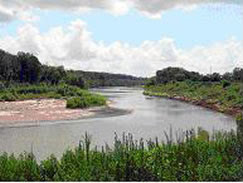 Usually we'd head for the Brazos river to spend the day, or sometimes two. Dad and the boys would fish or put out set lines for catfish. When we stayed for a couple of days, Mom would cook up the catfish and fry potatoes on the campfire. It just didn't get any better than that. 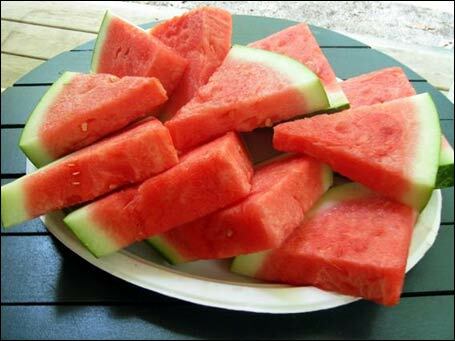 One thing I especially remember is, when we ate the watermelon, Mom would always collect the rind and put it in the cooler to take home. We were taught to use everything that was provided and not to waste. 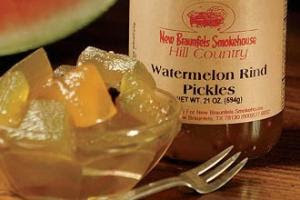 After we got home, Mom would use the rind of the watermelon to make Watermelon Pickles. We enjoyed our 4th of July bounty into the winter. The rind of one large watermelon. Peel and remove all green and pink portions from the rind. Heat the syrup and spices to boiling and allow to set for 15 minutes. Add the drained rind and cook until rind is transparent. A few minutes befor boiling time is up, you may add enough red or green food coloring to give the desired color to the pickles. This is optional, Mom never did, so I never do. Pack into hot sterilized canning jars to within 1/2" of top. Put on cap and screw band firmly tight. Process in Boiling Water Bath for 5 minutes. Should yield 6 pints. Adding the red or green food color could make a festive touch to serve at Christmastime. You would still be enjoying the 4th of July holiday in December. Family Traditions, Celebrations, and a Blog Potluck Invitation! Holidays were huge fun, growing up, and the 4th of July was no exception. Not only because we got to blow things up in the driveway, but the fried chicken and potato salad, the chilled watermelon, and the fun of setting aside most of a day specifically to play—whether that meant taking the horses out, having a water-balloon fight in the front yard, or the whole family packing a cooler and driving out to picnic under the shade of the cottonwoods in the coulee behind the house. Part of learning to create home around myself, as an adult, was learning to honor that need to take a day off and just play. One of my favorite ways to spend any holiday is to gather up friends and acquaintances without plans, and incorporate them into the celebration. Since I don't have a big yard this year, I won't be doing a 4th of July barbecue, but I'm definitely thinking about gathering up friends and packing a cooler full of that aforementioned fried chicken and potato salad. In that spirit, you are cordially invited to a virtual potluck celebration of family and friends and good food in time for the 4th of July weekend. If you'd like to post a link to this invitation for your own readers, please do! The more the merrier! I'll post a blog carnival round-up of everyone's posts, here, on July 2nd. You don't need to be a USian. 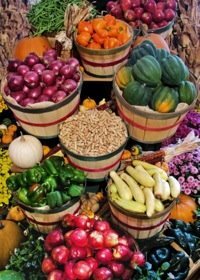 Just share a favorite memory, a favorite summer recipe, or anything else summer-nostalgia-cooking related that you feel like posting about and sharing with everyone. If you'll post a link in the comments, or email or PM your link to me in time to post the whole round-up on July 2nd, in time for the weekend. If you don't have a blog of your own, but you'd like to participate, just contact me and I'll put your piece up as a guest-post here on Creating Home. Heh. Then someone else can volunteer to host the next one! When I was a young mother raising my children, I was concerned about nutrition and being sure they ate properly and stayed healthy. Which meant not too many sweets and hold down the junk food and carbonated sodas; being sure they learned to eat a variety of vegetables and nutritious foods. But, at the same time, Moms want their kids to have reasonably healthy treats. I liked this recipe because it uses a minimum of ingredients and is simple to make and is sure better than store-bought. Of course, you're out of luck if your little ones don't like peanut butter. But, there again, I was in luck. Peanut butter was a staple at our house. My husband even learned to eat it. 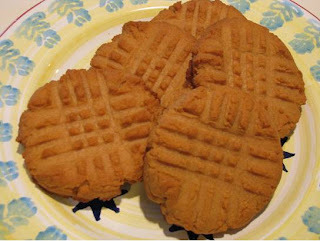 Mix peanut butter and sugar. Add egg and mix well. Roll into walnut size balls (or bigger). Place on an ungreased cookie sheet and flatten with fork (dip fork in granulated sugar to help prevent sticking to cookie). Bake at 350 degrees for 10 minutes. This recipe will double very well. You may want to start out with double as the cookies disappear fast. Just a quick heads-up for any of you veggie-lovers: Over on Marguerite Says you'll find Marguerite Butler's recipe for eggplant casserole. She took mercy on us, after much pleading in the comment thread, here. I remember Mom making something similar to this casserole, with cheddar cheese, saltine crackers, onion, and yellow summer squash. This one is definitely going on my list of eggplant dishes to try. One of the things I remember most fondly about my mother's kitchen is that us kids always tried at least one bite of something new. That thing where kids wrinkle up their faces and say "I don't like that!" when you know full well they've never tasted it before? There was no getting away with that, with my mom. Now, eggplant is a gorgeous creation, plump and purple and slightly alien-looking, with a flavor that's delicately reminiscent of fried green tomatoes but sweeter. I love eggplant. I love it grilled, baked, on pizza, tossed in pasta, roasted, or in salads. 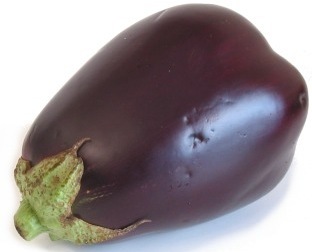 I love eggplant. That said, if you're feeding someone suspicious of hitherto unexperienced fruits and vegetables, here's a sure-fire way to get 'em to eat eggplant and ask for more. To begin with, pick out a lovely specimen; the skin should readily indent under the pressure of a fingernail and retain the mark. Eggplant is primarily fresh locally in the late summer and fall in more northern climates, but you can usually find eggplant from southern California or Mexico most of the year. This is fast and dead-easy. First, whip up a little seasoned flour. I usually take a couple of cups of flour, add some lemon pepper, seasoned salt, garlic and onion powder, and a healthy dash or three of cayenne pepper (you could use something like smoked paprika, though, and that would be yummy, too.) How much of each, you ask? I have no real idea, honestly, a couple of healthy tablespoons of everything but the salt. I'm in my forties, now, so I'm making a concerted effort to cut down on how much salt I eat; hence, the lemon pepper and cayenne. Save this recipe. I use it to cook almost anything I'm even a little suspicious of, and most meats. If it's edible, it's gonna be yummier chicken-fried. Mix it all up in a bowl (I usually just use my fingers, but if you're fussy or don't feel like washing your hands, a fork works just fine, too.) Here's the thing that takes a little experience, though: You need to taste it, to judge the level of salt and spices. You don't have to taste a lot, because, hello...dry flour. But you can simply lick the light coating of seasoned flour from the tines of your fork. If it just tastes bland and floury, add some more seasoning. Next, beat a couple of eggs in a bowl and add a big splash of milk. Maybe a quarter of a cup. If it's a really big eggplant and you're planning to cook the whole thing, use another egg or two. Wash your lovely purple eggplant, peel it, and chop it into one-inch cubes or thereabout. You don't actually have to peel it, but you might want to acclimate your picky eater to the idea of eggplant before asking them to eat something that nature serves inside a deep purple skin. All washed and peeled now? Great! Toss the cubes in the bowl of eggy-milk, making sure they're thoroughly wet but not gunky. Then toss the cubes of eggplant in the seasoned flour, just lightly coating them. Take your favorite cast iron skillet and put about a quarter of an inch of olive oil in the bottom, over medium to medium-high heat. You don't want the oil to smoke, but it should be hot enough to sizzle up if you flick dry a little flour off your fingertips into the hot oil. When your oil is hot enough, lay your pieces of eggplant into the oil. Give them a few moments to brown, then turn them and let the other side brown thoroughly. Leave enough space between the pieces of eggplant for them to brown thoroughly. If you think you need to brown the sides a little bit, go for it. The succulent little cubes should feel quite tender when you spear 'em with fork tines to turn over, in spite of the toothsome and alluring crunch of the breading. Yep. You've just made chicken-fried eggplant. Yay for you! Drain on a couple of layers of clean paper towels on a plate, and serve hot. Or serve warm. Or eat 'em cold out of the fridge the next morning when you're rummaging for milk to put in your coffee. I'm still not sure how I like 'em best. I do recommend not letting anyone dip them in ketchup...but if you're feeding little kids and that's how they want to do it, then hey. There are worse culinary sins. When my children were growing up, we lived 30 miles from a town. Needless to say, we did not run to the corner grocery to pick up a loaf of bread if we ran out. Even trying to plan ahead, there were times we ran out of things before shopping day. Fresh bread was always hard to keep on hand. 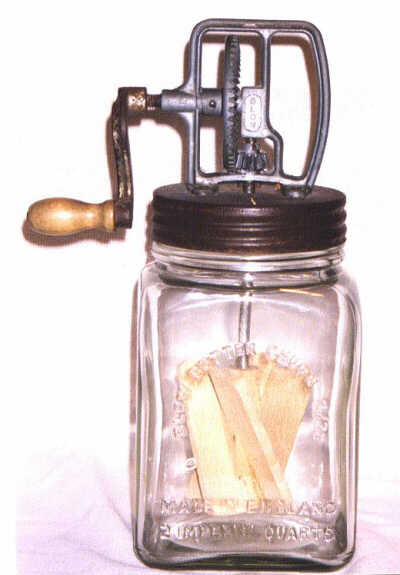 Keep in mind, this is before bread machines, so we did it the old-fashioned way. Fortunately, my next door neighbors, about 3 miles away, were a colony of very friendly Hutterites. One of the ladies who worked in the bakery shared this easy recipe with me. Add 1 cup flour to make batter. Knead on floured board until dough is elastic. Place in a greased bowl and grease top and cover and let rise 1 hour - punching down every 15 minutes. Cut into 3 equal parts and let rest for 20 minutes Shape to fit greased pans. Bake at 375 degrees for 30 minutes or until done. Crust will be brown and sound hollow when tapped. Recipe will double well and produce 6 loaves, using just under 5 pounds of flour. I always doubled it; because, especially in the summer, we had extra kids staying with us and the first two loaves were inhaled with fresh homemade butter. When Mama used to churn. Sometimes I'd take a turn. Oh, what a treat was mine! No matter where I dine. Since we were in the country and had milk cows, I was able to share the experience with Mac and my other daughters. I discovered it is a lot more fun in memories than in the actual doing, but nothing equals the taste. For those of you who have never experienced the taste of fresh homemade butter, you can do it with whipping cream and the electric mixer, although the fresh farm cream is better. Just whip the cream past the whipped stage until it makes butter. Drain the milk off (it is okay to drink), rinse the butter in cold water, kneading it, until all the milk is rinsed out; salt lightly. 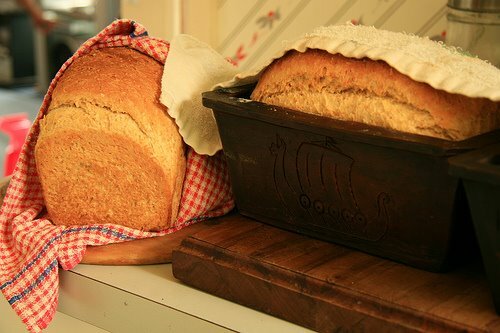 Spread on your fresh bread as soon as you cut the loaf and enjoy!! I grant you, buying a block of butter and making the loaf with a bread machine is easier and less time consuming, but not nearly as satisfying as doing it the old fashiond way and sharing the experience with your children and, in my case, the grandson. Every mom should try it at least once. Now that I have reached my "Golden Years", I look back on the years of raising my three children and one of the things I remember as being very special is being in the kitchen with my girls. They were always in the kitchen with me when I made meals or did dishes or churned butter of made special things, like cookies and breads and desserts. They were my helpers from the time they were tall enough to stand on a chair and reach the cupboards. They learned their fractions and to read from recipes. One of my favorite things was cooking with the girls. It was just fun, but they were learning life skills. I'd like to share this recipe with Moms with young children. It is quick and easy and fun for the kids. My grandson even got into the act after he came along. They all love doing it and love the results. Melt chocolate and butter. (If you use cocoa instead of chocolate squares, blend it into the sugar and just add the melted butter to the eggs vanilla and sugar). Beat the eggs, vanilla and sugar, add chocolate and butter. Fold in the flour. When well blended, drop by teaspoonfuls onto heated waffle iron and cook approiximately one minute. 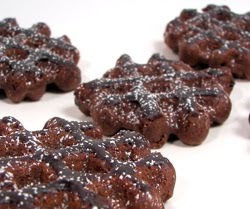 These are great plain or dusted with powdered sugar, or if you really want a chocolate fix, frost them with the Never Fail Chocolate Icing. Put all ingredients in a mixing bowl and stir until moistened then beat with beater to proper consistency. Moms, be patient and be prepared for a little mess and a LOT of fun with the little ones. My girls were operating the waffle iron from the start and felt like they were cooking, long before they were old enough to use the stove. If they burned a batch of cookies, no big deal, it's only four cookies. The memories are priceless.